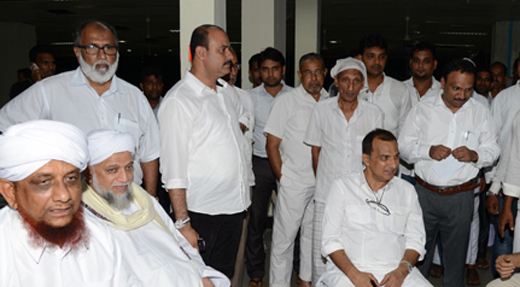 Mangaluru, Aug 2, 2016: Reports have come in that the number of people going on the annual Haj pilgrimage has come down across Dakshina Kannada district and also the state. The fall comes less than a year after hundreds of Haj pilgrims lost their lives following two back-to-back mishaps in Saudi Arabia. In Dakshina Kannada and the surrounding districts alone, a total of 628 pilgrims went to Mecca, as against the 670 last year. It is the same across state, with 4,477 people having listed for pilgrimage this year against the quota of 5,000-odd last year. As per statistics provided by Mangalore Haj Camp under the Karnataka State Haj Committee, the number of pilgrims has not crossed 1,000 - except in 2012, when a total of 1,060 people had taken the tour from the Mangalore camp. During the year 2014, 731 had gone to Mecca, as against 966 in 2013 and 810 in 2011, 867 in 2010 and 675 in 2009, the year when the flight service was introduced from Mangalore Old Airport to Mecca via Calicut. Reacting to queries, Chairman of Wakf Advisory Committee, Dakshina Kannada, S M Rasheed Haji attributed the dwindling numbers to the construction works undertaken at Mecca Madina in the year 2011. "As the works have been completed, the numbers are expected to pick up. Moreover, devotees from only four districts are boarding from Mangaluru now, as against five districts earlier, which is yet another reason for dip in the number of devotees," he explained. Accordingly, the first batch of 628 pilgrims will be leaving for the annual pilgrimage from the International Airport at Mangaluru to Madina, starting from August 4 up to August 8. About 140 pilgrims will board the maiden flight. Haj Officer Fairoz said, following the mishaps, the pilgrims this time have been restricted from bringing more luggage and cash. Also a set of do’s and don’ts called ’Haj Guide’ has been issued from Mumbai. Minister for Urban Development and Haj R Roshan Baig is scheduled to inaugurate the pilgrimage at 3.30 pm on August 3 at the old airport at Bajpe. Minister for Forests, Environment and Ecology B Ramanath Rai, also the district in-charge minister, Minister for Youth Empowerment and Sports and Fisheries Pramod Madhwaraj, MP Nalin Kumar Kateel, Rajya Sabha member Oscar Fernandes and a host of other leaders are expected to be present. Khazi of Dakshina Kannada Twaqa Ahmed Musliyar and P M Ibrahim Musliyar from Udupi will grace the occasion.